Emirates Printing Press LLC. (EPP), a globally successful, quality oriented printing house headquartered in Dubai in the United Arab Emirates, decided to purchase an inline machine system from Gallus Stanz- und Druckmaschinen GmbH. The Gallus ICS 670 will be used to make folding carton products in a seamless process - from the roll to the finished, die-cut blanks. For the 600 people strong company this investment is the next step in following its strategy to expand its activities in the packaging sector. 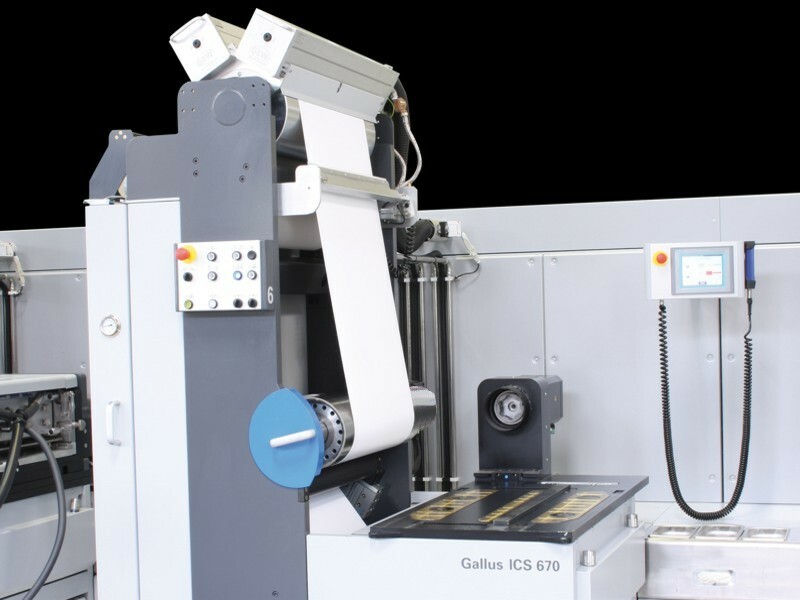 The Gallus ICS 670 destined for EPP comprises four gravure units, nine EVA (Easy Value Add) platforms, a rotary embossing unit, and the Gallus FCL 670 flat-bed die-cutter. Emirates Printing Press will use HiDef flexo printing and screen printing modules on the EVA platforms. Other finishing methods such as cold foiling, lamination, hot foil embossing, or rotary hot foil embossing can also be integrated in the platforms as options. EPP has been certified by several organizations for its exemplary quality and standardization policies, and regularly wins prestigious awards at international quality competitions. A total of sixteen heatset web offset, sheetfed offset and sheetfed gravure presses have so far been available at the printing company. In addition to books, magazines and assorted presswork, EPP also makes high-end packaging for cosmetics, perfumes, confectionery, and tobacco products on behalf of world famous brands. The HiDef flexo printing and gravure units, rotary embossing unit, and Gallus FCL 670 flat-bed die-cutter have meanwhile successfully started production at EPP. The outstanding print quality of the Gallus ICS 670 has already been testified to by an application engineer at a leading ink manufacturer. Parallel to this, the operator team has received further on-site training from Gallus specialists in the run-up to the new inline machine system's final acceptance at Emirates Printing Press. Bunting Magnetics Co. will exhibit its complete line of coatings in booth 347 at Labelexpo Americas 2012. For more than 50 years, Bunting Magnetics Co. has developed and manufactured precision magnetic products for the worldwide printing, automobile, plastics, food, and electronics industries. 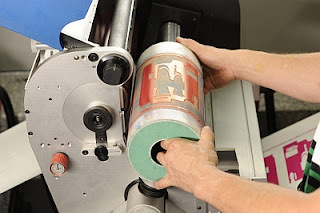 Bunting Magnetics Co. supplies printers around the world with magnetic die cutting cylinders, two-piece can printing cylinders, and corrugated carton printing cylinders. Bunting flexible magnetic dies for label and packaging printers are 100 percent chemically hardened and machine-sharpened. Bunting flex dies are available in widths of 30 inches or less, and with coatings formulated to exacting standards for the substrate being cut. FFEI Ltd, the global developer of award-winning digital imaging solutions, announces its partnership with Brazilian-based plate manufacturer IBF for the distribution of its full range of commercial CTP solutions. Recognising the high quality and cost benefits provided by FFEI products, IBF will distribute FFEI's market-leading Alinte violet CTP system and RealPro complementary software suite to its Brazilian customer base, further extending FFEI's sales channels into Latin America. IBF, the world's 4th largest plate manufacturer and market leader in Brazil, exports to more than 70 countries and employs over 1,000 dealers worldwide. According to Andy Cook, FFEI managing director, IBF's extensive sales network and proven track record were key factors in finalising the partnership. "We are delighted to have reached this agreement with IBF, a leading supplier of graphic arts products in Latin America and a global player, continuing our policy of partnering with market leaders. We believe that IBF's unrivalled local knowledge and large reseller network will help us penetrate the Brazilian market with our complete commercial CTP portfolio, and enable us to achieve further success in other emerging economies." Through its reseller partners, FUJIFILM, Technova and Founder, FFEI has become the number one supplier of commercial CTP systems in India and China. FFEI's Alinte CTP system contains an award-winning, low cost, internal drum solution designed specifically to meet the requirements of emerging markets, offering all the attributes of FFEI's longstanding product range - high image quality, fast plate production, simple and automated operation - but at a lower investment cost. IBF will also distribute FFEI's latest RealPro Workflow system, designed specifically to complement FFEI's Alinte CTP range and providing commercial printers a complete end-to-end workflow. "In a Brazilian marketplace that is expanding rapidly, print shops expect high quality products and are always looking to keep up-to-date with the latest technology. So we are truly excited to reach this agreement with FFEI because its CTP solutions complement our portfolio, aimed at customers who demand robust build quality and low total cost of ownership. This new addition to our CTP offering will help us address the needs of several market segments." Alinte 8 Range - aimed at commercial printers, the Alinte 8 range offers one of the highest level of automation and productivity options in the market. Delivering up to 70 8 page plates per hour at 1200 dpi and up to 50 8 page plates per hour at 2400 dpi, the Alinte 8 offers maximum productivity with a low cost of ownership, along with a Queen's award winning internal drum for superior image quality and accuracy. Alinte 4 Range - the Alinte 4 range is a B2 prepress series offering a wide choice of automation, quality and productivity options, plus the flexibility of having field-installable upgrades should productivity needs change. Users can also benefit from low cost of ownership, image accuracy, repeatability and registration. RealPro Workflow - a modular, scalable workflow software for commercial, hybrid and packaging printers seeking a fast, modern, upgradeable, easy to use, automated production workflow system. Based on the latest Adobe PDF Print Engine 2.5 technology, RealPro Workflow System is a pure PDF workflow which preserves the original PDF content and offers a host of features that include pre-flighting, automated imposition, archiving, ICC based colour management, 3D proofing and more. "The number of CTP units now selling into emerging markets continues to exceed our expectations, with the demand for lower cost, high quality systems on the rise," comments Cook. "We are very proud of our achievements in price-sensitive markets against stiff international and domestic competition, providing what we believe is a unique product offering designed to meet the requirements of our customers. Our aim is to continue this success into Latin America with the addition of another world class partner in IBF." 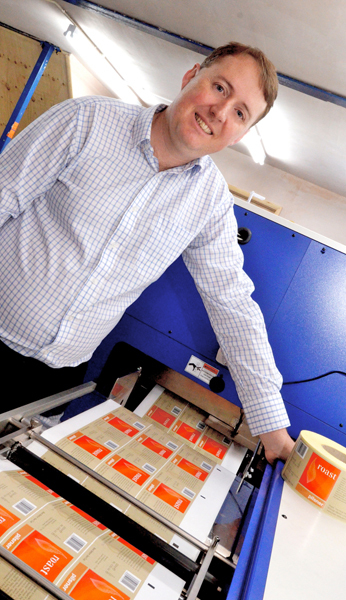 Superfast Labels is an apt name for the family-owned label printer in Sittingbourne, Kent. Although only 6 months since the company installed the UK’s first Epson SurePress L-4033A digital label press, the machine has just printed its 6 millionth label. Superfast Labels (www.superfast-labels.co.uk) offers high-quality, self-adhesive printed labels with an incredibly fast turnaround time – often in 24 hours. The addition of the SurePress L-4033A has allowed the company, previously solely a flexo house, to broaden its services into digital printing which is an ideal solution for many applications. The addition of the six-colour SurePress L-4033A has not only added high-quality, affordable digital print to Superfast’s capabilities. It has allowed the company to expand into lucrative new markets such as short-run jobs, and offering high quality, cost-effective print services to local small businesses. As well as being able to print on standard labelling substrates without resorting to pre-treatments or special coatings, the ability for the SurePress L-4033A to print on textured substrates has opened-up new commercial opportunities with small-volume artisanal food and drink producers looking for a quality, bespoke-looking result. Labels West has been in business since 1978 and specializes in the production of self adhesive labels used primarily for product packaging. The industries they serve include food and beverage, wine, and personal care. They are known for high quality, multi-color labeling. In a soft economy, they were looking for ways to cut costs without impacting their ability to serve their customers. Labels West began researching job tracking solutions that use barcode technology to track their jobs. They purchased the CheckMate tracking system to solve their problem and to automate their job tracking process. They use the unlimited user version of the software running on individual PC’s on the production floor. A Honeywell Voyager corded scanner is attached to the PC’s for increased accuracy and speed. Effective 1 July 2012, Oliver Finkeldey was appointed to represent the eltromat office in Bangkok, Thailand. Oliver, a German national, has 20 years experience in the printing and packaging industry, including 16 years in Asia. The nomination is the next step of the eltromat strategy to increase the market presence in Asia and to expand international sales activities. In this capacity Oliver Finkeldey will be responsible for all sales activities in Thailand, Vietnam, Philippines, Malaysia, Singapore, and Japan. Oliver began his industry career in 1992 as a rotogravure and flexo printer at two mayor printing and packaging converters in Germany. In 1997 he was offered the opportunity to be part of a green field project in Shanghai, China. This involved setting up and establishing the gravure printing section of a global company. In the following years the desire to become a salesman was born and Oliver managed different sales projects in many parts of the world particular in Asia. After almost 20 years of experience he created his own consultancy company in 2011. 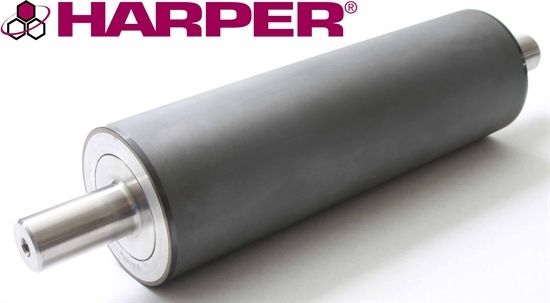 Alan Rogers and Juan Bermudez, valued employees at global anilox roll supplier Harper Corporation of America, have been recognized for their professional performance with promotions. 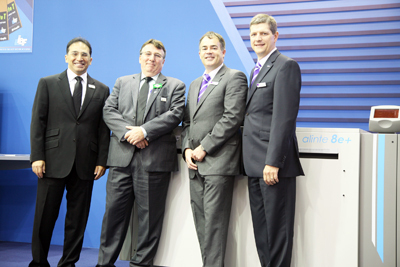 As of June 18, 2012, Alan Rogers is the Vice President of Sales for the United States and Canada and Juan Bermudez is the Vice President of Sales for Latin America. In his new position, Rogers will oversee all Harper sale activity within the United States and Canada. Additionally, he will supervise the Customer Service team and head up corporate relations. Rogers joined the Harper family on May 24, 2004 as a Technical Account Manager. He holds a Bachelor of Science in Industrial Management from Georgia Tech and has worked as a member of management at various organizations since 1987. Bermudez, in taking on the role of Vice President of Sales for Latin America, will oversee the efforts of agents, sales, and growth within his territory. As such, he will head up the Latin America sales team. On October 6, 1997, Bermudez joined the Harper family as a Regional Sales Manager for Latin America. Bermudez holds a Bachelor of International Studies and a Master of Business Administration in Management and Marketing. Additionally, he has earned FIRST certification as an Implementation Specialist, which allows him to bring a great deal of knowledge and insight into the flexographic industry. Harper Corporation of America is looking forward to the accomplishments both Rogers and Bermudez will achieve in their new roles and congratulates them on their success. Esko, a worldwide leader in packaging solutions, announces that 532 people - 180 more than the previous record-breaking crowd - attended the recently concluded EskoWorld User Conference, held June 17-20 at the Hilton New Orleans Riverside. The overwhelmingly successful program, which brought rave reviews from everyone involved, provided a complete update of all the new Esko products introduced during drupa 2012, as well as a wide variety of industry outlooks, product presentations and future roadmaps - along with workshops for anyone with an interest in packaging, displays, and printing. After Simon James, Esko VP Global Marketing, welcomed and officially opened EskoWorld 2012, Bernard Zwaenepoel, Esko Senior VP Software Business, greeted the audience and offered a complete update of Esko products that were introduced at drupa. Jan De Roeck, Esko Director of Solutions Management, provided an overview of the fourteen hectic days of drupa, and offered a perspective of how the most important trends for packaging and labels could influence businesses in the future. In an environment where process and market knowledge is vital to remain competitive, Malcom Keif, Ph.D. of Cal Poly State University delivered a challenging keynote address to the audience, offering people ideas of how to create and sustain knowledge. Dave Hall (EFI Radius), Willi Welsch (Quick Brown Fox – Aramis), Andy Armitage (SolarSoft), and Mike Rottenborn (Hybrid Software) participated in a business system integration panel. This year’s Partner Pavilion benefited from sharing breakfasts and lunches in the same room. Attendees actively pursued Esko partners to ask questions about shared technologies during session breaks and meals. EskoWorld Partners also delivered presentations about their companies during breakfast. These included Cape Systems, DuPont, EFI, Enfocus, HP, Hybrid Software, MacDermid, The Quick Brown Fox, Solarsoft, Southern Lithograph, TOPS, and X-Rite. EskoWorld 2013 is planned for May 19-22, 2013 at the Pointe Hilton Tapatio Cliffs Resort in Phoenix. FlexTech Alliance, focused on developing the electronic display and flexible, printed electronics industry supply chains, announced the completion of a research project with Clemson University for benchmarking printing processes in roll-to-roll manufacturing of printed electronics components. The FlexTech Alliance funded study is an important first step in understanding conductive printed features fabricated using full-scale printing presses as opposed to laboratory scale equipment. The study, performed at the Sonoco Institute of Packaging Design and Graphics at Clemson University, yielded a number of insights into the performance of flexographically printed conductive features. A variety of factors were investigated including plate type and preparation conditions, plate tint and patterning, press speed, substrate type, printed feature size, press orientation, and line and gap width. The printed traces were evaluated by electrical and optical measurements. Over 45,000 resistances were measured, and nearly 1,000 three-dimensional optical profiles were obtained. Full results of the study were made available to FlexTech Alliance members. Clemson dedicated the Sonoco Institute of Packaging Design and Graphics in March 2009. It is the only university program in the country that brings together packaging science, graphic communication, and the materials, environmental science, manufacturing, marketing and psychology disciplines to study packaging methods. 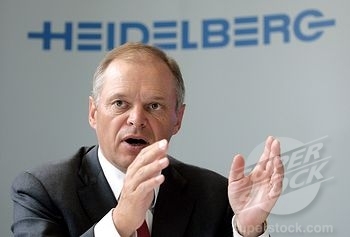 Bernhard Schreier, CEO of Heidelberger Druckmaschinen AG (Heidelberg), will not be extending his management contract when it expires midyear 2013 and will be leaving the company at the end of 2012. He is handing over the company's chairmanship after almost 13 years in charge. Over recent months, key steps have been taken to set the company's new strategic course and a start has been made on putting this into practice to return Heidelberg to sustained profitable growth. What's more, the industry trade show drupa has led to the highest quarterly incoming orders in four years for the first quarter of financial year 2012/2013. The Supervisory Board and Schreier himself feel now is the right time to make the change in order to create new impetus at the very top of the company. The Supervisory Board unanimously appointed Dr. Gerold Linzbach (56) as Heidelberg CEO with effect from September 1, 2012. Schreier will ensure the transition goes smoothly and will accompany the handover process up till the end of the year. "I would like to thank Bernhard Schreier for his achievements as Heidelberg CEO. In a career spanning a total of 37 years, 13 of them as CEO, he has truly made his mark on the company and has succeeded in guiding it through two major global economic crises and structural upheaval in the printing industry. Particularly in very difficult recent times, he has helped transform Heidelberg from a traditional press manufacturer into a solution and service provider in the print media industry," said Robert J. Koehler, Chairman of the Supervisory Board of Heidelberger Druckmaschinen AG. "Heidelberg is a global market leader and is renowned worldwide for its cutting-edge technology and customer proximity. In Dr. Gerold Linzbach, we are delighted to have found a successor with international experience to press ahead with the company's strategic reorientation and ensure its return to profitability. Dr. Linzbach has many years of management and capital market expertise, which will help pave the way for a successful future at Heidelberg," he added. Dr. Gerold Linzbach (born in 1956) obtained a degree in chemistry and added a PhD in chemical engineering from the University of Dortmund in 1985. Having started his career as the head of a research group at the DECHEMA Institute in Frankfurt, he joined McKinsey in 1988 where he was in charge of a variety of projects, primarily in the process industry. In 1991, Dr. Linzbach became a member of Hoechst AG's corporate planning team and subsequently took charge of this department. During this period, he was part of the "Aufbruch 94" team that laid the foundations for Hoechst AG's new corporate structure. Four years later, he assumed the position of global CEO of a business unit responsible for the company's fibers operations (Trevira GmbH). In 1999, Dr. Linzbach played a leading role in founding Aventis and went on to become global CEO and President of the Celanese Acetate Group based in the United States until 2003. From 2003 to 2005, he was responsible for the textile fibers division INVISTA, also in the United States. On March 1, 2005, Dr. Linzbach was appointed Chairman and CEO of Symrise AG in Holzminden, Germany. He successfully led it onto the stock market at the end of 2006 and onto the MDAX in March 2007. Dr. Linzbach left the company for personal reasons at the end of June 2009. He was subsequently appointed CEO and Member of the Management Board of D+S Europe and its successor companies in Hamburg. TLMI (Tag & Label Manufacturers Institute) has announced the recipients of association scholarships for the 2012-2013 academic year. TLMI gives awards scholarships to students on an annual basis within three scholarship categories: the Member Company Employee Scholarship Program, the Four Year College Degree Scholarship Program and the Two Year Degree Scholarship Program. Member company employee scholarships are awarded to qualified employees to further their studies and strengthen their commitment to the industry. Awards may support coursework toward either an undergraduate or graduate degree. Four year college degree scholarships are awarded to qualified full-time college students who are entering their third or fourth year of study and who are pursuing a degree to prepare for a career in the narrow web industry. Two year college degree scholarships are awarded to students enrolled in a flexographic printing program at a two-year college or a degree-granting technical school. • Tammy Sue Tlachac – Lakeland College: Belmark, Inc.
Mondi Group, a leading international paper and packaging company, announced that it has agreed to acquire 93.4% of the outstanding share capital of Nordenia International AG from funds managed by Oaktree Capital Management, L.P. and certain other minority shareholders for a total cash consideration of EUR240 million. In addition, Mondi Group will assume EUR398 million of debt and debt-like liabilities implying an enterprise value for 100% of the Company of EUR655 million. Nordenia is an international supplier of innovative consumer packaging solutions and hygiene components with 12 fully invested operating facilities located in seven countries across Europe, North America and Asia. Additionally, a wholly owned greenfield plant currently being constructed in China is expected to begin operating in early 2014. Based on Nordenia’s EBITDA and EBIT for the year ended 31 December 2011 of EUR99 million and EUR70 million, respectively, the implied enterprise value equates to 6.6 times 2011 EBITDA and 9.3 times 2011 EBIT. The EUR240 million cash consideration payable for the Acquisition will be funded from a new EUR250 million two year committed bank debt facility. The Acquisition is expected to complete in the fourth quarter of 2012, subject to customary completion conditions including the approval of certain competition authorities. Nordenia is a leading supplier of innovative consumer packaging solutions and hygiene components. Consumer packaging solutions contribute approximately 60% of Nordenia revenues, and include re-closable bags, stand-up pouches, advanced films and laminates for mainly fast moving consumer goods sector. In 2011, sales to the FMCG sector accounted for over 90% of Nordenia revenues. 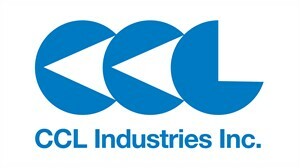 CCL Industries Inc., a world leader in specialty packaging solutions for the consumer products and healthcare industries, announced today that it has acquired the assets of the Pharmaceutical Division of Graphitype Printing Services, a privately owned printing company located near Sydney, Australia, for AUD$7 million paid in cash. The acquired business produces labels and patient instructional leaflets for leading pharmaceutical customers in Australia and will complement the existing CCL Label Healthcare operation in Melbourne. Graphitype's Pharmaceutical Division sales were AUD$7.3 million for the twelve-month period ending June 30, 2012, with EBITDA of approximately AUD$2.5 million. Dave and Kath Morris, the founders of Graphitype Printing Services, will continue to operate their commercial printing business as an independent company. Steve Morris, the business leader of the Pharmaceutical Division, has signed an employment agreement as part of the transaction and will join the Healthcare and Specialty group of CCL Label North America and Australia led by Jim Sellors, Group Vice President. The acquired business will immediately change its trading name to CCL Label. Geoffrey Martin, President and CEO of CCL Industries said, "The Healthcare sector continues to be attractive for us and we have been very successful with similar acquisitions in this product space in the recent past. The excellent facility in Sydney and the great team assembled by the Morris family while building the business will strengthen our position in Australia with sites now located in both of the key pharmaceutical manufacturing centres in the country." With headquarters in Toronto, Canada, CCL Industries now employs approximately 6,400 people and operates 72 production facilities globally located to meet the sourcing needs of large international customers. CCL Label is the world's largest converter of pressure sensitive and film materials for label applications and sells to leading global customers in the consumer packaging, healthcare, automotive and consumer durable markets. CCL Container and CCL Tube are leading producers of aluminum aerosol cans, bottles and extruded plastic tubes for consumer packaged goods customers in the United States, Canada and Mexico. Sprint Print & Packaging, based in Kathmandu, Nepal have experienced rapid growth and as part of their expansion plans the company installed a seven colour Edale combination UV/IR Scratch Card line with a wide range of additional options. Sprint, who are from a printing background, were previously in commercial printing for the production of newspaper and magazines. More recently, with the introduction of the new Edale press, the company have expanded into scratch card and label production. The 510mm wide press is configured with seven UV/IR flexo units, an Edale CR80 card stacker; which takes multiple streams of standard format CR80 cards from a die cut unit and transports them in a continuous stack in discreet lanes, in sequence, and a complete personalisation system including digital variable data printing, data verification , void product logging and tracking. The Edale system offers a highly productive single pass telephone card production; this latest installation is based on Edale’s Gamma printing and converting line. The Gamma SC-510 is fully servo driven and comes in web widths of 430mm or 510mm with the ability to handle substrates from 12-600 micron. Servo drives on each print head provide pre-register, auto-register and print length control features. This, combined with the revolutionary print head designs, ensures job change times and set up wastage are kept to a minimum with the ability to perform a full station colour change in under 70 seconds. The Gamma SC-510 can be customised to suit the exact requirements of the customer and this specific machine was designed to combine the multiple processes normally associated with scratch card production, in a single pass. This rationalises the production process, eliminates work in progress and increases the security and traceability of the cards. This single machine has been designed to produce up to 1.5million pins per hour. “This new press allows us to better serve our customers by utilizing new capabilities and services that go beyond what we could previously offer” stated Shishir Nahata, Director of Sprint. “It also allows us to expand our reach further and be more flexible to our customers changing needs”. As well as running the scratch card production, Sprint also customised the press with additional special options to allow them to also run ‘normal’ production, so they can also adapt it for the printing and converting of various kinds of labels and cartons. “The installation of this scratch card line illustrates the high security of the Edale personalisation lines and the latest flexo technology available, eliminating outsourcing and providing our customers with turnkey service, shortened cycle time, and enhanced quality levels on specialized packaging,” said James Boughton, Edale’s Managing Director. Shishir Nahata says “We decided on an Edale as we were highly impressed with Edale’s engineering skills, and there are no installations in Nepal which can incorporate such a wide range of substrates, this machine seemed infinitely flexible being able to print on 12 – 600 micron substrate and also add additional options to the press at a later date – to us, this makes our equipment completely future proof”. Flexo press technology is typically used for printing high-quality labels and packaging. The Edale Personalisation line at Sprint delivers superior productivity and efficiency and is designed to handle very thin film substrates, helping to expand capabilities to include overwraps on collectible trading cards using fin seals, specialized packaging applications, prime labels and unsupported films for bottle wraps. The newly installed flexo press offers several advantages over traditional presses, including minimal ink usage and reduced waste to support environmental considerations, while the fast make-ready times enhance productivity rates, especially for very large projects. Adestor, the self-adhesive paper and films division of Torraspapel, part of the Lecta group, is proud to launch an innovative new product tool for its customers. The new Adestor website, featuring advanced product search capabilities and easy access to any element in the product portfolio, is designed to help customers find just what they need, in the fastest way possible. Detailed information, ranging from product certificates to technical specifications, is available in five different languages – English, Spanish, French, German and Italian - aimed at meeting our customers’ needs. Also featured are the key strategic factors that differentiate the Adestor brand and service, making it clear to potential customers just how Adestor products can help them. The Adestor mill, located in Almazan, Spain, saw significant investment in 2011-2012, doubling its production capacity. On the other hand, a new converting hub has been opened at the Lecta Group’s Cartiere del Garda site in northern Italy, to further improve service to customers in the central, northern and southern European markets. Investments in both projects have totalled over 23€ million. The environment has always been a priority for the Lecta Group, leading it to adopt best practices to ensure sustainable industrial development. The Almazan manufacturing site holds ISO 14001 and EMAS Environmental Certifications, FSC and PEFC Chain of Custody Certifications as well as ISO 9001 Quality Management Certification. With a current production capacity of 500 million m2, Adestor is one of the leading self-adhesive material manufacturers in Europe. Printers in emerging countries increasingly invest in technology made by Heidelberger Druckmaschinen AG (Heidelberg). Particularly the market for packaging printing is growing: A recovering economy in various countries in the Asian Pacific region has led to improved consumer confidence and increased consumer spending. Demand for consumer goods, and consequently for their packaging has also increased. Food, non-food and beverages categories registered positive packaging unit volume growth. Increased demand for product quality and safety, have prodded packaging printers to innovate and invest in high quality equipment. Packaging printers from Vietnam are mainly investing in a press that is able to handle thick substrates: the Speedmaster CD 102. Viethung Packaging invested in a Speedmaster CD 102 six-color with coater and extended delivery, which was recently installed in Hung Yen. The press complements a Speedmaster XL 105 five-color, installed in 2009. Viethung primarily prints folding cartons for the electronic industry in Vietnam. Packaging and Label printer Khatoco has installed a new Speedmaster CD 102-6+L in May. Binh-Tan-based Khatoco, one of the leading packaging printers in Vietnam, is producing cigarette packaging and labels for the growing beer label industry in Vietnam. The new press runs alongside a Speedmaster XL 75-LY-6LX, which had been installed in 2008. As one of the leading printing houses in Vietnam and Southeast Asia, Viettel Printing has signed an order for two Speedmaster CD 102-6+L X UV. The presses are to be installed at the company's premises Ho Chi Min City and Hanoi. What's more: The order includes a complete postpress packaging order: Polar systems, two Easy Gluers EG 100 folder gluers and a Variamatrix 105. The company mainly produces boxes for cosmetics, as well as pharmaceutical, industrial, candy and food boxes. Renowned folding carton manufacturer S. Silpa in Nonthaburi started their humble business with a SORZ. Founded in 1958, the company grew fast and is today employing around 300 staff. S. Silpa is continuously developing its quality system. Equipped with a considerable range of Heidelberg presses - one Speedmaster CD 74, three Speedmaster CD 102 presses, and a Speedmaster XL 75 - the latest press, a Speedmaster CX 102 eight-color with coater and UV, will be installed shortly. Part of the deal is a Polar 137 XT Autotrim cutting system. S. Silpa mainly produces folding cartons for the food, pharmaceutical, cosmetic and consumer goods industries. Printing Solution Company (PSC) specializes in printing plastics for premium boxes for the cosmetic, perfume and healthcare industry. The Bangkok-based printer mainly supplies Japanese manufacturers. The company, established in 2002, is enjoying phenomenal growth resulting in a new Heidelberg press being purchased annually: The recently installed Speedmaster XL 75-8+L UV works alongside a Speedmaster XL 75-6+L UV, a Speedmaster CD 74-6+L UV, a Speedmaster CD 74-5+L UV and a Speedmaster SM 74-5+L UV. PCS's management consults Heidelberg Thailand on a regular basis to brush up their knowledge on the latest technology. L.L.H Printing & Packaging (LLH) in Samut Prakan, already equipped with a Speedmaster CD 102 six-color with coater from Heidelberg, recently decided to install their second Speedmaster CD 102-6+L in an elevated version. LLH not only opted for Heidelberg because of quality, reliability and Heidelberg Thailand's after sales service, but also because the majority of their international customers insist on packaging products being manufactured on Heidelberg presses. S. Pack and Print (S. Pack) Company Limited, based in Songkhla, engages in the manufacture and sale of corrugated and duplex board packaging products and also provides offset printing services in two factories. The print shop recently completed the installation of a Speedmaster CD 102-4+L. In the past, the company was equipped with used equipment from various suppliers. After the Japanese company Oji bought a shareholding of S. Pack in 2011, the production was restructured - the used equipment did not meet their expectations. Since S. Pack's customers are satisfied with the performance of the Speedmaster CD 102, the company plans to purchase a second Speedmaster CD 102-6+L for a third factory to be opened early next year. Green Life Printing, a new Thai print shop established as a partnership project between the companies HN Group and Print City, definitely is a green printer. The customer decided in favor of a Speedmaster SM 102 four-color press and benefits from Heidelberg Thailand's knowledge on green printing and HEI ECO. Green printers project a growingly positive image to the market. The ideal press for commercial print shops: India's commercial and packaging printers primarily opt for the Speedmaster SM 74 from Heidelberg. Commercial and packaging printer Ratna Offsets Ltd. installed a brand-new Speedmaster SM 74 four-color plus a Polar cutter 115 XC Plus. In addition, the customer signed for a Suprasetter A 75 to be installed in fiscal year 2013. The Ahmadabad-based company employs a workforce of around 50. The Speedmaster SM 74 is an ideal printing press for commercial print shops focusing on solid growth. Owner Dr. Vipul Shanker Pandya founded his company in 1980. New-Delhi-based Maatti Design recently installed a Speedmaster SM 74 five-color standard pile machine. The company, founded in 2005, consists of a team of product designers from various fields of expertise. The former competition customer invested in Heidelberg and now works with his first sheetfed offset printing press in their press room. The commercial and packaging printer also decided in favor of a new Polar cutter. A brand new Speedmaster SM 74-4-H has been installed at Modest Graphics in Delhi. Also a former competition customer, Modest Graphics invested for the first time in Heidelberg. The decision in favor of Heidelberg resulted from two facts: best technology and best value for money. With the new machine installed, the company successfully started its export business. Agarwal Print Media (Agarwal), a commercial and packaging printer located in the small district Meerut at Uttar Pradesh, has made a big step forward: The company with a workforce of more than 50 has installed a brand new Speedmaster SM 74 four-color, a Suprasetter A 105 and a Polar 115 XC Plus cutting machine. Agarwal, which almost concluded a deal with a competitor, has built a new state-of-the-art building to have their machines running under one roof. 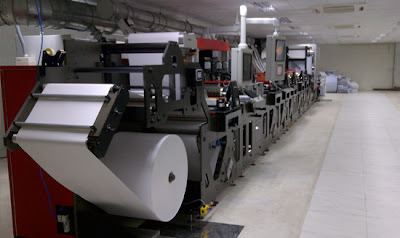 New Delhi-based commercial printer India Offset just installed a new Speedmaster CD 102 four-color. Before the new press was commissioned, the print shop had been running A1 size presses from a competitor. With the new Speedmaster CD 102 the productivity level is now at least four times higher than before. India Offset supplies the government, corporations, and organizations all over India with magazines, annual reports, books, labels, calendars, folders and much more. Kamala Printing Press is a commercial printer with a workforce of around 30. Based in Varanasi, a district of Eastern Uttar Pradesh, the customer has invested in a Speedmaster SM 74-4, which is just being shipped from Germany to India. The Speedmaster SM 74 is the first brand new press in this area and will replace a second hand competition machine. Malaysia's first Speedmaster SX 102 eight-color perfecting press goes to Percetakan Nasional Malaysia Bhd (PNMB). The wholly owned unit of the Ministry of Finance opted for the Heidelberg press on the occasion of drupa 2012. The growing customer demand for fast turnaround times and excellent quality at a reasonable prize prompted PNMB to invest in Heidelberg's latest technology. Established in 1888, PNMB was incorporated in 1993 becoming wholly owned by the Ministry of Finance in Malaysia. The company's services include general printing, variable data printing, security printing as well as document and imaging management solutions. PNMB is located in Putrajaya, a planned city located 25km south of Kuala Lumpur. Since 1999, Putrajaya has served as the federal administrative center of Malaysia. Singapore commercial printer Asiawide Print Holdings Pte Ltd. (Asiawide) is committed to delivering high quality by means of latest technology. Following the investment in a Stahlfolder Ti 52 in 2011, the company decided to install a Heidelberg Speedmaster XL 75 in late January 2012. Additional orders include the latest Prinect Pressroom Manager and the Prinect mobile solutions. Reasons for the print shop's choice are manifold: the well-known brand, reliability as well as the expertise of the Heidelberg staff and commitment in providing total solutions. 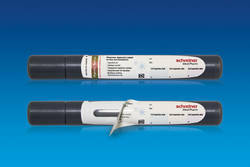 Schreiner MediPharm is now offering a suite of additional innovative functions for its new autoinjector labels that enhance ease of use and safety of these injection aids. A temperature indicator, UV protection for the inspection window, detachable label parts, counterfeit protection features and an abrasion-resistant field for subsequent variable marking can additionally be integrated. Each label is customized for the respective injection system. The temperature indicator used by Schreiner MediPharm delivers a new value-added benefit. By producing a reversible color shift, it indicates that a defined temperature has been reached. The special ink may change color at a specific refrigeration temperature and the coloration will disappear once room temperature is reached. This provides the user with an indication of the correct storage or dispensing temperature. To protect sensitive pharmaceuticals from UV rays, the transparent window that allows the content and fill level to be checked is reliably covered. For this purpose, the label features a two-layered design. The top layer provides UV protection for the window underneath which is integrated into the label. To check the content, the user opens the label by means of a starter tab and then simply closes it again. In addition, detachable label parts remind the patient to regularly check whether or not the drug inside the container is still okay. The label parts can also be used for documentation purposes in the patient’s medical file or medication diary. A text field coated with a special varnish allows subsequent abrasion-resistant laser printing of variable data. Integrated security features such as the special LaserSecure pigment can be used to confirm the authenticity of the pen with the help of a reader. Additional protection against counterfeiting is provided via a security ink showing a color shift depending on the viewing angle. “The new label characteristics enhance ease of use and patient safety of autoinjectors and can be combined individually. As a development partner, we welcome the opportunity to work together with manufacturers to customize special functions to match their specific requirements,” says Ann L. Merchant, global President of Schreiner MediPharm. The new full servo M5 370 mm press is equipped with short web path, driven chilled drums, 10 UV flexographic print units, and accessories to produce coupon labels and unsupported films. The new M5 integrates the new “revolutionary” Gidue converting section (NewSnowBall, Bamby) which increases die-cutting and stripping speeds up to minimum 50% faster than traditional methods, Gidue reports. During Labelexpo Americas, which is taking place from 11 to 13 September 2012 in Chicago, Gallus is joining forces with Heidelberger Druckmaschinen AG to showcase the job-optimised manufacture of labels in a hybrid production environment. The Hybrid print production describes the various ways that conventional and digital printing can be used together. The focal point of the presentation at Labelexpo is the Gallus Print Shop concept, which is using a Gallus ECS 340, Gallus ECS C and Heidelberg Linoprint L to show how digital and conventional printing methods can complement each other when used to print labels. The Prinect and CERM workflow solutions from Heidelberg are being used to integrate the different methods. To support the digital printing of labels, blister packs and films, Heidelberg is supplying the inkjet systems of CSAT, the digital print specialist it took over in the summer of last year, under the name Heidelberg Linoprint L. The Linoprint L (previously the iTS6oo) is a drop-on-demand system for the cost-effective and sophisticated printing of short to medium label and film runs and applications with variable content. During the fair, Gallus and Heidelberg are exhibiting an integrated, hybrid solution for digital label printing. Comprising the Heidelberg Linoprint L, the Gallus ECS C processing solution and Prinect and CERM workflow solutions, this solution can be used to execute short runs and print pioneering applications such as smart labels, security printing and trackable labels. Under the banner of “high performance digital converting”, the Gallus ECS C digital converting system combines the best aspects of conventional label printing with the possibilities offered by digital printing. Based on the revolutionary Gallus ECS 340, Gallus has created a digital converting solution with the innovative, format-free die-cutter at its heart. Minimal changeover times and virtually waste-free job changes are made possible by front loading, a sleeve system, chambered doctor blade, presetting and an extremely short web path. The robust design, based on technical granite, and the Gallus register control function combine to ensure exceptionally smooth operation and high processing quality even at very fast speeds. 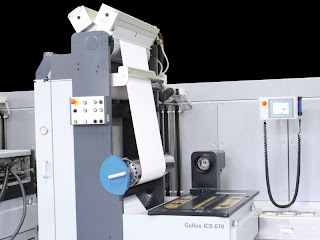 Developed to handle the output of up to two highly productive, commercially available digital presses, the Gallus digital converting system can be used whenever there is a need for uncompromising productivity at minimal cost per label – and particularly when complementing the Heidelberg Linoprint L. The modular structure also opens up an unexpectedly wide range of applications. Almost any configuration is possible, from the compact version consisting of a die-cutter and flexographic printing unit to a multicolour configuration with finishing processes. Today, digital technologies are playing an ever greater role in the entire workflow, from order entry and prepress to actual printing and dispatch. In the past, the digital technologies used in label printing have primarily been deployed for production purposes. However, with ever shorter runs leading to a growing number of printing jobs, the amount of work involved in managing and planning these jobs prior to the start of printing will also grow. As a result, digital order processing will increasingly emerge as a bottleneck in the entire workflow. 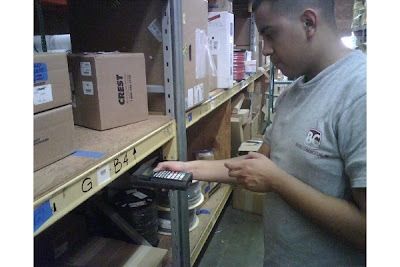 Administrative and logistical processes in the print shop also have to be adapted accordingly. CERM offers impressive business management and automation software that delivers customised solutions for all workflows along the entire value creation chain of a label print shop. The highly successful market launch of the Gallus ECS 340 will also enter its next stage at Labelexpo Americas 2012. In 2009, state-of-the-art technologies and construction materials new to the label industry, such as technical granite, led to the creation of an exceptionally innovative machine concept that boasts a spellbinding design and maximum productivity. The new era of cost-efficient commodity label manufacture that was heralded at the time has now become an integral part of everyday operations for many Gallus ECS 340 users. Numerous innovative further developments will be on show at Labelexpo Americas - impressive proof of the close, cooperative relationship Gallus enjoys with its customers. This in turn results in a wider range of applications for the Gallus ECS 340. The range of options for the Gallus ECS 340 is also being expanded by important elements such as automatic register control, hot-air drying and sheet delivery. The Gallus Print Shop concept at Stand 5803 will give visitors to Labelexpo Americas an insight into these impressive end-to-end solutions that cover all aspects of an order from its receipt right through to its fulfilment. Moreover, exhibits including various latest-generation presses will also offer live demonstrations of efficient hybrid production using a whole range of printing methods.